T-L Photo/ ROBERT A. DEFRANK Don Smithberger, right, superintendent of St. Clairsville’s electric department, accepts awards from American Municipal Power Ohio from Mayor Terry Pugh. The city was commended for safety, the conversion of street lights to LED lights, and the construction of infrastructure for the St. Clair Commons. 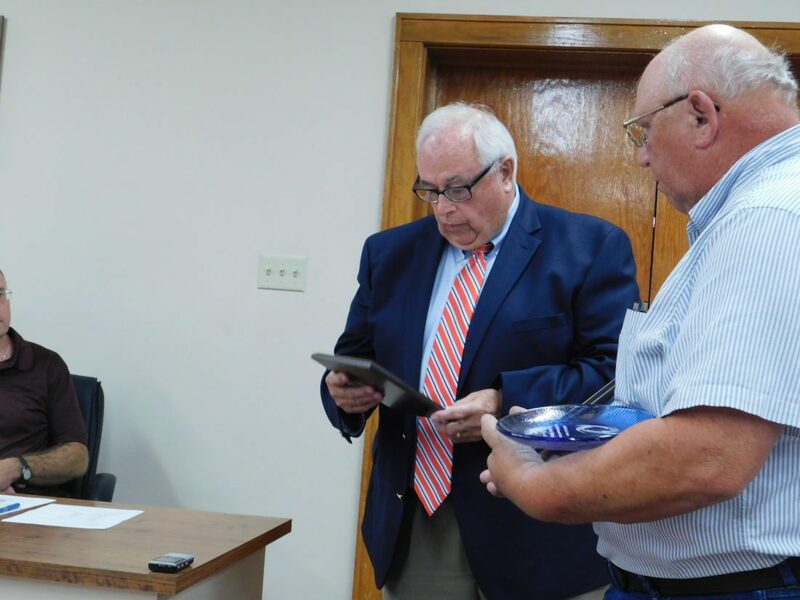 ST. CLAIRSVILLE — The city has received recognition for safety precautions and infrastructure improvements with an eye to savings and to expand utilities for possibly incoming businesses. Don Smithberger, superintendent of the city’s electric department, accepted three awards on behalf of his department during American Municipal Power Ohio’s conference in Cleveland for 2018 projects and achievements. The awards were for the conversion of streetlights on Main Street to light-emitting diodes (LEDs), the construction of new infrastructure for the St. Clair Commons and for the 21st year the city received an award for safety. Smithberger said the LED project began in late January and was completed near July 1. He said the city expects a yearly savings of $10,000 to $12,000 on maintenance. Smithberger added that kilowatt consumption is also reduced, with a conservative estimate of $15,000 to $20,000 saved yearly. He added that the electrical infrastructure for the commons was initially conceived of in 2004 in its engineering phase, and has been a continual project that saw final completion of the first phase early this year, with more additions to come should businesses move into the commons area. The past two years have seen street lights and a lift station at the commons. About 95 acres are now open to provide utilities. “We’ve got a pretty good investment out there. We’ve got right about $500,000 in that project,” he said, adding that there are provisions to power more businesses using the underground cables. Currently, the Senior Suites at St. Clair Commons has been erected as a senior living facility, but the need for additional repairs has delayed its opening. Charity Stackhouse, administrator of the facility, said there is no current timeline for an opening, but she is eager to begin housing residents. St. Clairsville Mayor Terry Pugh said he viewed the safety award as the most important. To qualify for a safety award, the department has monthly safety meetings and OSHA compliance meetings. “We have four meetings with AMP Ohio directly for lineman safety,” Smithberger said. “The whole city has a team attitude,” he said. “The departments are good about helping out if we’re short-handed, if we need some extra help. He added that the electric department currently has a three-man crew. He would prefer a fourth lineman for two two-man crews. “That would make the job easier and a little safer too,” Smithberger said.